CABLE HIGHLIGHTS: Discovery’s GOLD RUSH led Friday cable, up 0.11 to 0.85, with a lead-out special at 0.57. 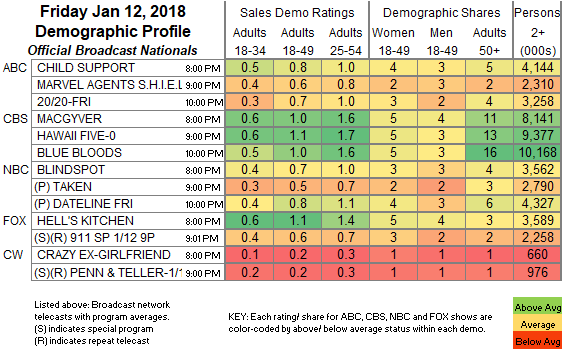 A&E’s LIVE PD ticked down to 0.74. ESPN’s NBA doubleheader was at 0.62/0.56. On HGTV, MY LOTTERY DREAM HOME rose 0.08 to 0.46, HOUSE HUNTERS built by 0.05 to 0.41, and HOUSE HUNTERS INTL was up 0.05 to 0.35. MSNBC’s RACHEL MADDOW SHOW easily led the demo in cable news at 0.38/0.60/3.4M, above CNN’s ERIN BURNETT OUTFRONT at 0.25/0.36/1.1M and Fox News’s THE FIVE at 0.23/0.37/2.4M. 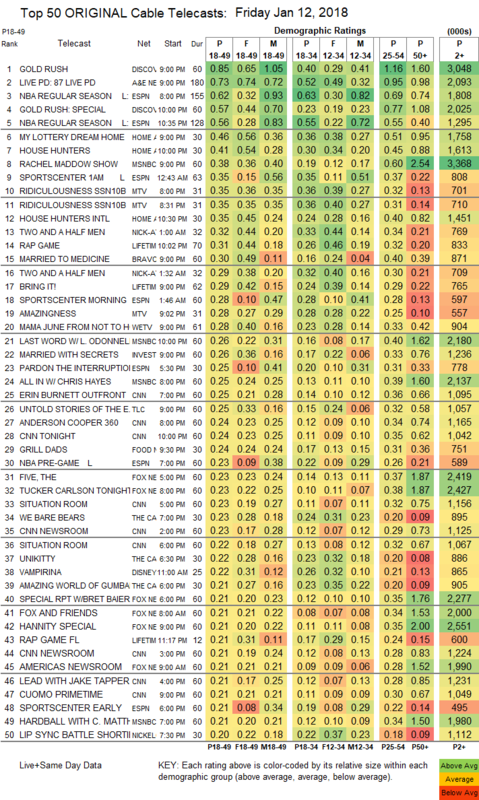 On MTV, RIDICULOUSNESS was at 0.35/0.35 compared to last week’s pair of 0.32s, and AMAZINGNESS was up 0.07 to 0.28. On Lifetime, THE RAP GAME dipped 0.03 to 0.31, and BRING IT ticked down to 0.29. Bravo’s MARRIED TO MEDICINE fell 0.12 to 0.30. We’s MAMA JUNE: FROM NOT TO HOT returned at 0.28. ID’s MARRIED WITH SECRETS was steady at 0.26. TLC’s UNTOLD STORIES OF THE ER was at 0.25, compared to last week’s 0.27/0.26. On Food Network, GRILL DADS dropped 0.04 to 0.24.